The rugged countryside in this part of the Apennine Mountains is indescribably beautiful. At 650 metres above sea-level, there's a retreat where your mind can totally relax; and all 100% "Made in Italy". Pennabilli is located in the Val Marecchia (Marecchia Valley), named after the river flowing through it. The river Marecchia runs all the way to the city of Rimini, from its source 1003 metres up, about 20 km from Pennabilli. The valley of Marecchia is surrounded by the regions of Marche, Tuscany and Romagna. Historically speaking, it’s the cornerstone of the Montefeltro-area and its traditions are diligently maintained. The countryside is simply breathtaking and abundant with various species of wild animals and plants, most of which are protected. Pennabilli lies geographically and culturally on the border with three regions. Hence, the local gastronomy offers a great variety of tastes from these very different nearby regions. 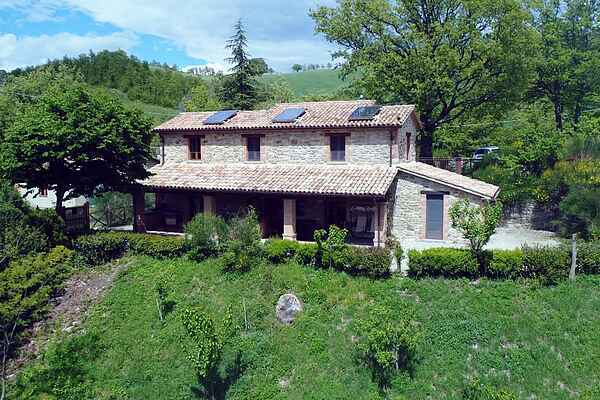 The appartment has a beautiful veranda facing the green Tuscan valley. Ideal for a couple or small family. All materials used are high-quality and the aim of the owners has been to be as environmentally friendly as possible both in interior and in exterior design. Just ask for any other small kitchen appliances you might need. For cycle fans the owners have a variety of models to offer; from mountain bikes to sport or racing bikes. Feel free to ask! Cooking lessons for who wants to learn how to prepare delicious Italian home-made food with local cooks. Miss Elisa teaches you how to make the best pizza in the world. There’s a museum for everyone! Within a range of 20 km there is a nature museum, wildlife museum, maths museum, bread museum, cheese museum, mining museum, fossil museum, art museum, home museum, and church museum, as well as Medieval castles with their high towers from which the views are just fantastic! According to the latest study, (book “Codice P”/Nesci-Borchia) Altopoggio lies in the background of the most famous painting in the world, the Mona Lisa. We organize tours on the very spot on the hills where Leonardo da Vinci was inspired by the beauty of this upper-Marecchia-valley. Maybe you could get the same feeling and paint on the spot your own vision of it! Also other famous Renaissance-era painters (Raffaello, Piero della Francesca..) have immortalized these landscapes in their paintings. You can either visit these places by yourself or with a guide. This is a new concept experiencing art in an open air museum and we can assure you that the view hasn’t changed much in 500 years. This area is rich in its traditions and they’re kept alive with enthusiasm. You can always find a festival going on in one of the nearby villages, whether ancient, gastronomical, antique , religious or historical. If you’re feeling brave, you could try the festival of frogs or visit a Tuscan truffle-feast? We have wide selection of books in the apartment and BBQ is waiting for you on the terrace together with hammoc. Try Yoga or picking the blackberries which are very common in this area.